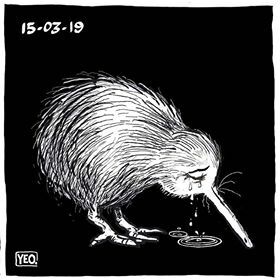 This picture of a kiwi, the national bird of New Zealand, symbolizes the grief about the bloody neofascist terrorism. Like that kiwi, I cry. I wish all survivors strength and recovery. Especially the injured people now fighting for their lives in Christchurch hospitals. Fears for the injured and missing in the Christchurch mosque shooting: here. So, today, a murder gang of presumably three racists massacred people at two mosques in Christchurch, New Zealand. Their leader is an Australian nazi; an admirer, as he wrote, of Norwegian fascist murderer Breivik; of South Carolina, USA mass murderer of African American Christians Dylann Roof; and of the Islamophobic murderer at the Finsbury, London mosque (who had plans to murder British Labour party leader Jeremy Corbyn). He also wrote wrote that United States far-right Trump supporter Candace Owens, notorious for whitewashing Hitler, inspired him. He had five firearms, including two semi automatic weapons, all legally. I was in Christchurch myself briefly, years ago. I saw Australians there. Fortunately, they were Australian magpies building their nest; not Australian nazis. One should hope that the revulsion about this crime may stop the endless ‘war on terror‘ which self-styled Christian George W Bush called a crusade. That war created the climate for neonazism and for Islamophobic crimes. One should hope that revulsion about this massacre will stop discrimination. However, one should fear that right-wing politicians will abuse this bloodbath and people’s anxiety caused by it to have yet more policemen, more armed forces, less democratic rights. Like they abused other bloodbaths. In Christchurch, many people try to help each other. This is also the case with Manjinder Singh: he is a taxi driver and gives free rides to people trying to get out of Christchurch city center, wanting to return to their families. Sikhs have, eg, been the target of governmental Muslim extremism in George W Bush’s ‘new’ Afghanistan; when things for, eg, Sikhs, women, etc. became even worse than under the Taliban. United States Islamophobic nazis who don’t know the difference between Sikhs and Muslims have murdered Sikhs. Like United States Islamophobes who don’t know the difference between Hindus and Muslims have murderously targeted Hindus. Good that there is there still solidarity and love, as exemplified by the New Zealand people bringing flowers. Let it prevail over Islamophobia, anti-Semitism, hatred of Africans, hatred of Roma, homophobia, transphobia, misogyny, hatred of Latin American refugees, and all other forms of hatred. Worldwide anti-racism demos ‘come at a critical moment’: here. This entry was posted in Crime, Human rights and tagged Islamophobia, New Zealand by petrel41. Bookmark the permalink. It is a terrible day for Christchurch, New Zealand and the World. This sort of thing should not be happening anywhere in the world. Thoughts out to anyone that was affected by the act of violence. Yes, terrible! People should find out who helped in this crime, so it won’t happen again. I pause in silence for the victims. So do very many people all over the world.